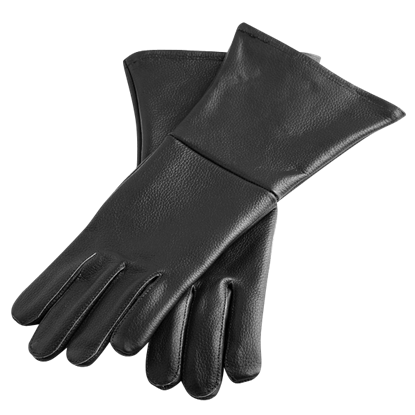 Gloves aren't just a fashion accessory no, they serve a purpose, even if, sometimes, that purpose is to compliment an outfit perfectly. But at other times, gloves exist to serve other purposes: they can offer a modicum of protection for the hands when faced with a life-or-death battle, they can add extra grip when needed to a sword or shield hand, they can hide the hands for whatever reason is necessary, and in a pinch, they can even be worn to keep your hands warm. 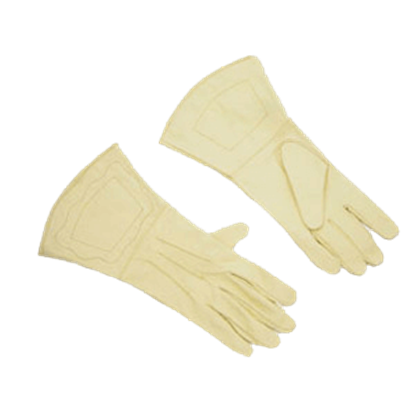 But regardless of use, we offer a wide array of gloves for your wearing pleasure: plain leather gloves, white leather gloves, and suede gloves. And that is not even counting the gloves we feature from such well-known sources as Robin Hood and Assassins Creed. So check out our glove section today; they are simple but effective, and they make great additions to almost any costume. Protect your hands when entering into combat with the help of these top notch leather gloves! 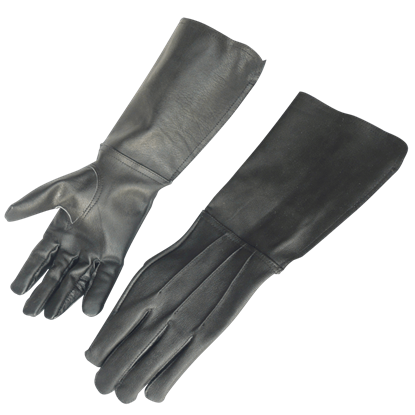 The Black Leather Historical Gloves are ideal for training, drilling, and dressing for re-enactments with their comfortable fit. Protect your hands when entering into combat with the help of these top notch leather gloves! 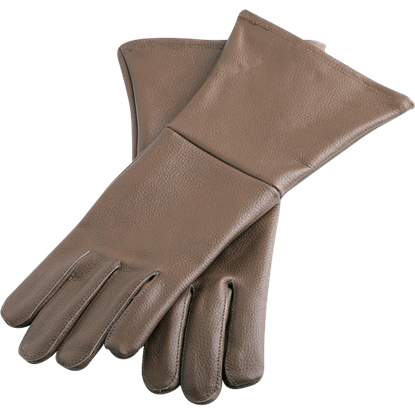 The Brown Leather Historical Gloves are ideal for training, drilling, and dressing for re-enactments with their comfortable fit. These Civil War gauntlets are made of top grain cowhide leather and are available in three different sizes. The Civil War gloves are natural color and will protect your hands during that sword fight. 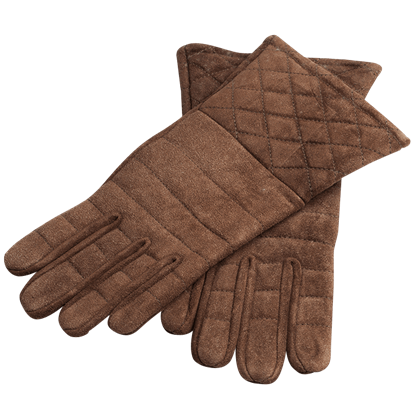 These soft suede gloves are the perfect accessory for any medieval inspired or LARP outfit. 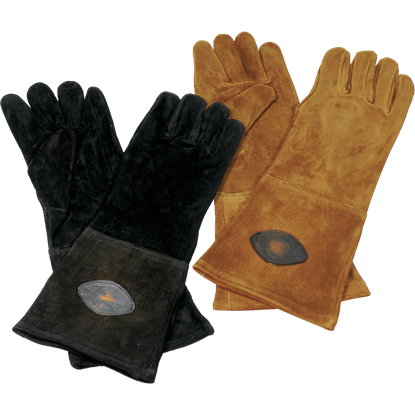 Exceptionally comfortable, the Hartwig Suede Gloves are sold in pairs and great for wearing on their own or underneath gauntlets. The long-cuff construction of these supple, leather gauntlets has been seen throughout the ages. Our gauntlets come undecorated to let you customize for your favorite era. They go great with almost any look imaginable. 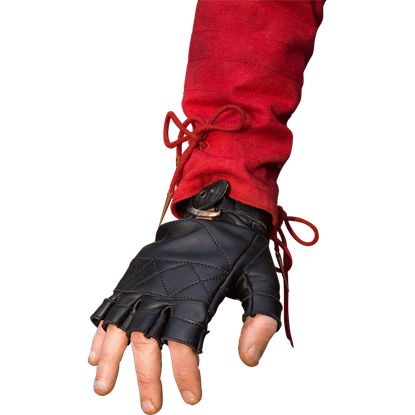 Whether you are fond of birds or simply need a good pair of gloves to round out your historical outfit, the Medieval Falconers Gloves will do the trick. 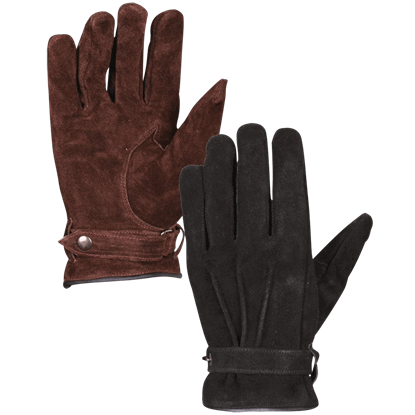 These forearm length gloves are made of leather with select suede detail. 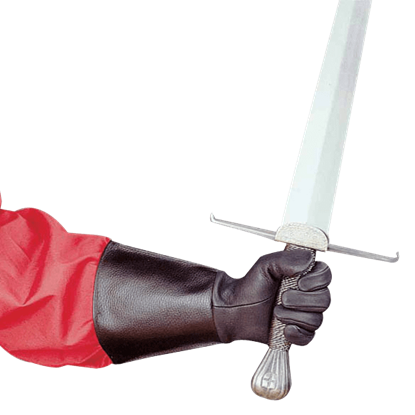 A good pair of gloves goes great with just about any medieval look. 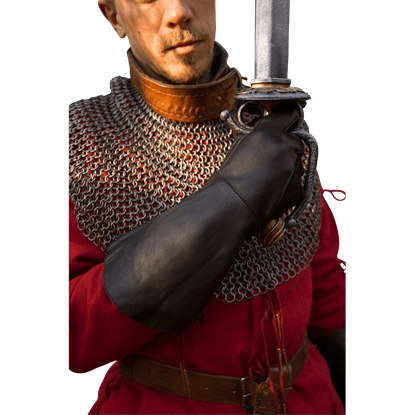 Knights, kings, brigands, swordsmen, warriors, wizards, rogues, and more can benefit from the style and versatile appeal that these Medieval Leather Gloves offer. Maintain a firm grip on your bow as you let loose an arrow, striking your target between the eyes. 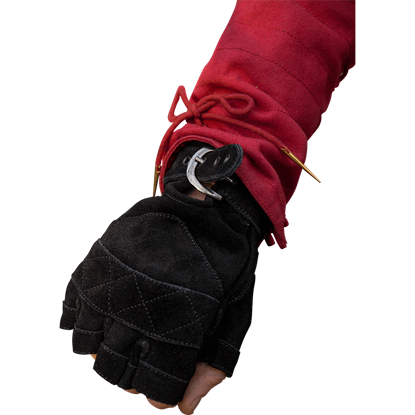 The Robin Archers Glove protects your drawing hand from the inconvenient injury and pain caused by recoiled strings and passing arrows. You cannot underestimate the power of a great pair of gloves. Whether as the next piece of your cosplay, reenactment outfit, or LARP character, the Suede Celtic Gloves will help you form a cohesive look while lending light protection. 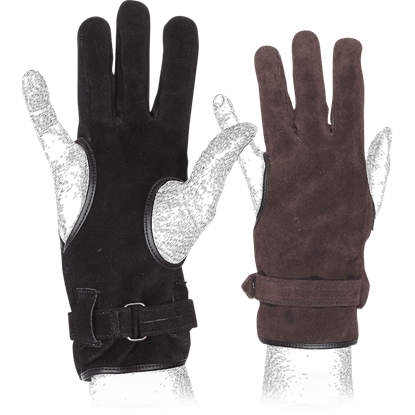 Most gauntlets are not intended to be worn without an underlayer of protection, and these Suede Gauntlet Gloves offer that protection in comfortable style. They feature a top stitched quilted appearance and moderately extended cuff.